Limited production : only 12,000 bottles of CHINATI CLASSICO, 8,000 bts : RISERVA, 4,500 bts : SASSI CHIUSI, 3,500 bts : ROSATO. The legendary gardian of Tuscany Sangiovese, Guru Giulio Gambelli(is, so to speak, Italian Henri Jayer. He made SOLDERA, POGGIO DI SOTTO, MONTEVERTINE) took care of La Porta di Vertine in the last stage of his life. 限定生產“：只有12000瓶CHINATI CLASSICO，8000 瓶RISERVA，4500 瓶SASSI CHIUSI，3500瓶ROSATO。托斯卡納的桑嬌維塞傳奇守護者Giulio Gambelli (SOLDERA, POGGIO DI SOTTO, MONTEVERTINE) 在他生命的最後階段照顧著La Porta di Vertine. La Porta di Vertine’s was founded in 2006, which is a amphitheater shaped vineyard in Vertine, a tiny ancient hamlet in the Chianti Classico area of Gaiole. Its main interests are to explore the characteristics of Sangiovese by selecting vineyards and soils to exalt and reflect the complexity and longevity of the variety, in order to bring the masterpiece wines to all wine lovers. Giacomo Masteretta – La Porta di Vertine’s wine maker and director – has his own philosophy of “less is more” and it is being applied throughout the vineyard and cellar, natural is always the best when people have to do as little as possible in a vineyard. The vineyard management produces small, healthy grape bunches and the average yield per plant is one kilo or less of fruit. 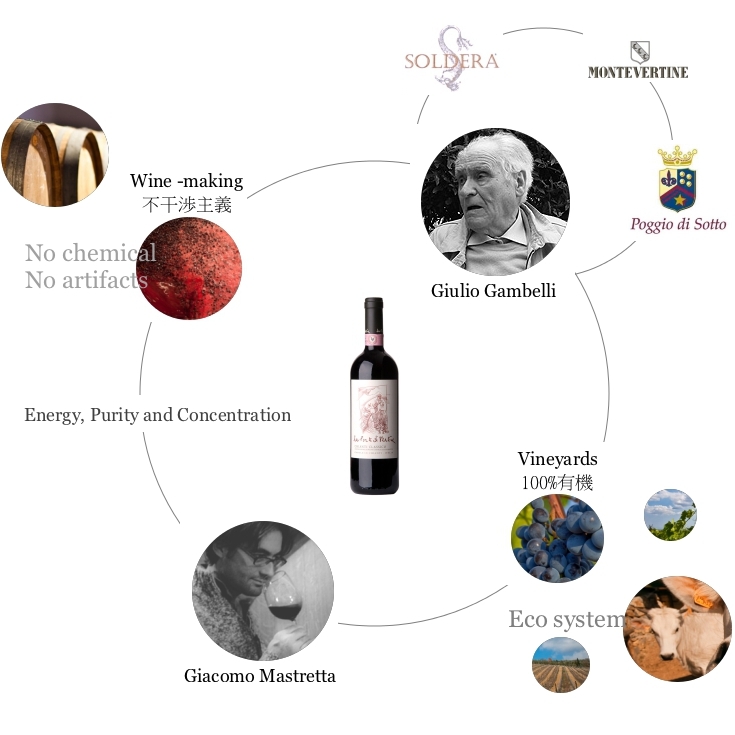 La Porta di Vertine is also honored to have Giulio Gambelli – Sangiovese’s legendary advocate to be their oenological consultant for the first two vintages 2006 & 2007. La Porta di Vertine sees its greatest advantage in the Galestro and Alberese (shale and limestone) soils, whose content makes the region – Chianti Classico unique. The estate tends to use natural viticultural method to cultivating high altitude vineyards in order to sustain the landscape and regenerate the environment. The soil’s high stone content stores the heat of the sun and radiates it back to the plants at night, the constant movement of air in these desolate terrains naturally helps in battling with fungal disease. La Porta di Vertine has also experimented with ungrafted vines, which makes the wine more wonderful, intense, rich and full flavored. The low nutrient content of La Porta Di Vertine’s soils is not seen as a challenge. In fact, it’s the key to the personality in final wines. The low nutritional soil helps to grow natural yields in low vigor and increase the extract. As a result wines are balanced and elegant, delivering the perfume and freshness of the grape variety, and in time gaining in richness and complexity without losing any of their initial vibrancy. The wines are aged in the traditional Slovenian Oak casks as well as oval Austrian casks and double barrels.